The Amigo Point of Sale v6 has reached end of life. 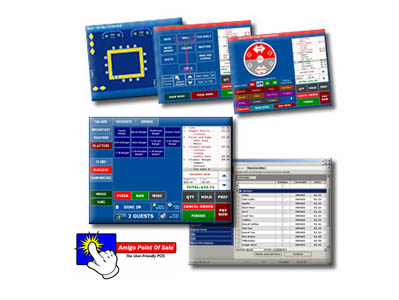 Amigo POS software is an affordable, well-rounded and highly intuitive point of sale solution for use on the Windows XP platform. Amigo POS is versatile enough for establishments with single or multiple locations. The attractive user interface displays only the screens employees' security rights permit, eliminating cumbersome navigation and streamlining transaction processing. 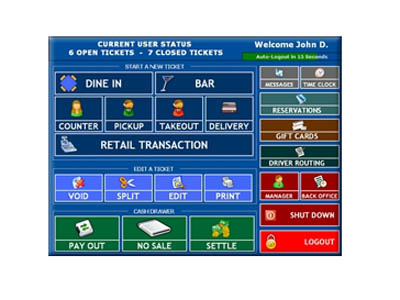 Ideal for restuarants, Amigo POS also features a hotel interface for Micros compatibility. Amigo POS integrates with PC Charge Payment Server for fast, instant credit card processing. Amigo support and training contracts are in-house, information on coverage can be found here. Amigo Point of Sale v7 is now available. 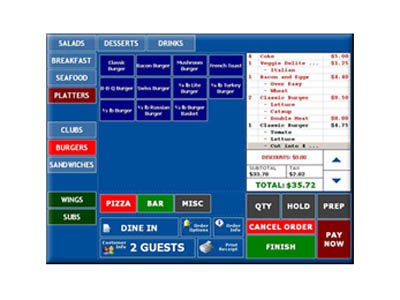 Our road test of Amigo POS software reveals an easy-to-use, eye-pleasing interface, and the Back Office functionality allows the user to make changes to food menus in real-time. The cost-to-features ratio of this product makes it an exceptional value. We definitely recommend purchasing the version with in-house support, as that ensures you are covered if you run into problems. Find it faster! Click here to compare Point of Sale v6 models by feature.